If you are sewing on a mechanical machine or an older computerized model, you are missing out on the benefits of modern technology. Our OPAL™ 650 computerized sewing machine is extra-efficient with loads of built-in assistance to change the way you sew for the better! 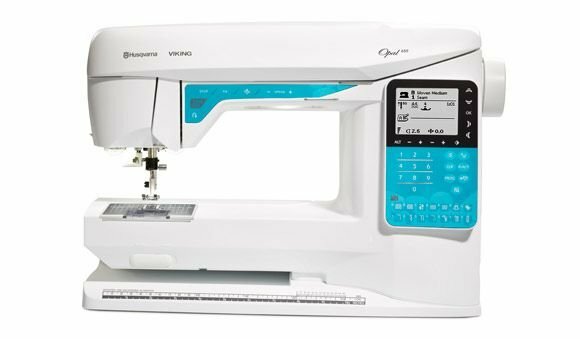 Let your Husqvarna Viking® OPAL™ 650 sewing machine focus on delivering the best results while you relax and focus on the joy of sewing! There are 3 built-in fonts for personalizing, labeling and dating your sewing projects. Program and save personal stitch settings to the “My Stitches” menu. 160 beautiful stitches for endless creative opportunities including 7 mm stitch width. The Perfectly Balanced Buttonholes (PBB) and the Exclusive Sensor One-Step Buttonhole Foot automatically sews perfect one-step buttonholes every time. The Built-in Needle Threader makes threading so easy. The Sew On Button Program means buttons are attached easily by machine! 160 beautiful stitches and 3 built-in fonts for personalizing.